3 kinds of Sirloin Third Pound Burgers are available in New York Tri-State area (NY, NJ and CT), and as soon as I heard about this special burger on Burger Lad's post, I got "Steakhouse." Today, I got another one and it's "Bacon & Cheese." On the HP, I couldn't see the sauce well so that I asked a cashier if it contained mayonnaise, and she said it's ketchup and mustard, so I could get it as it was. 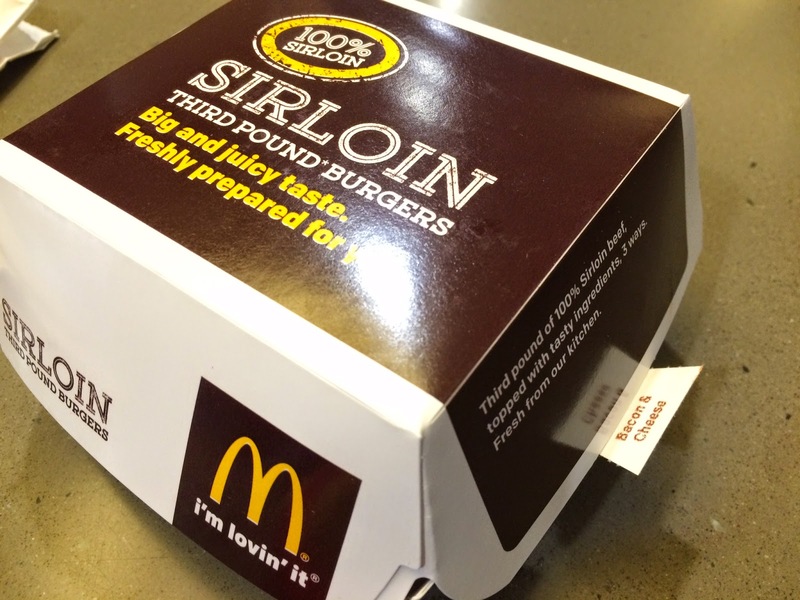 This box had "Bacon & Cheese" tab sticking out. 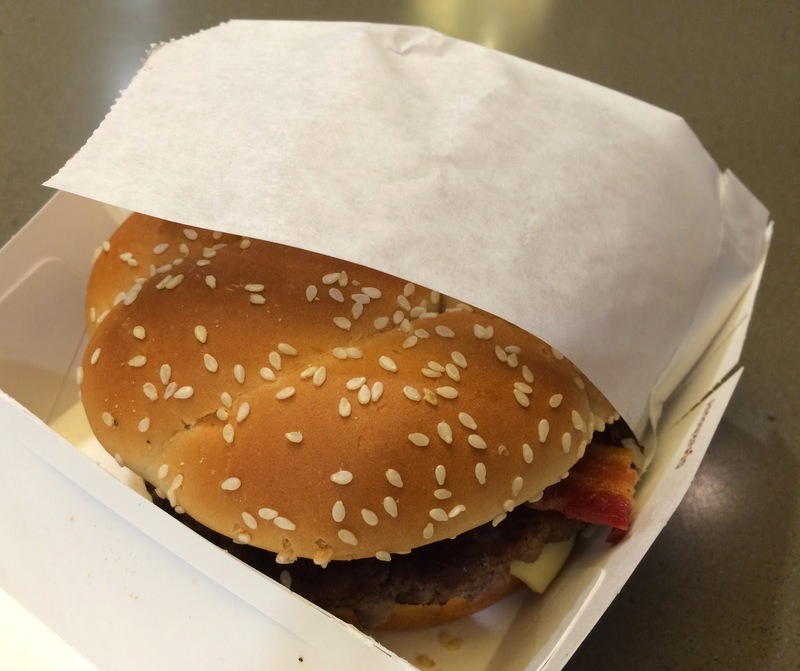 Unlike Steakhouse, about a half the burger was wrapped in a white paper. 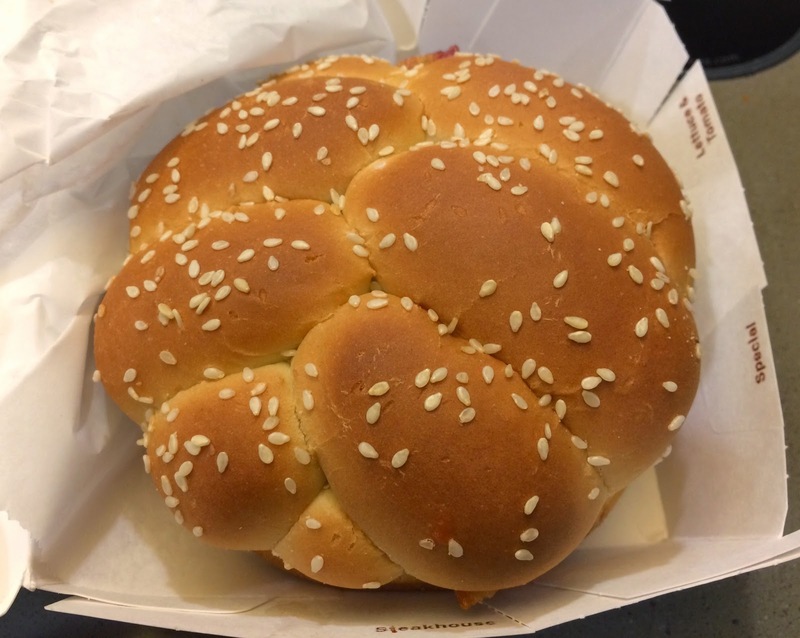 The bun was the same white sesame seeds and the pattern reminded me of challah (a Jewish bread eaten on Sabbath) or braided hair. Underneath the upper bun, there're ketchup, 3 fresh red onion rings, about 5 slices of pickles, 3 bacon strips (I think), white cheddar and a patty. I didn't see mustard though I was informed there would be, but I don't like mustard that much, so it's actually perfect for me. From the side, it's less messy than Steakhouse as there's no creamy and runny sauce in this Bacon & Cheese burger. 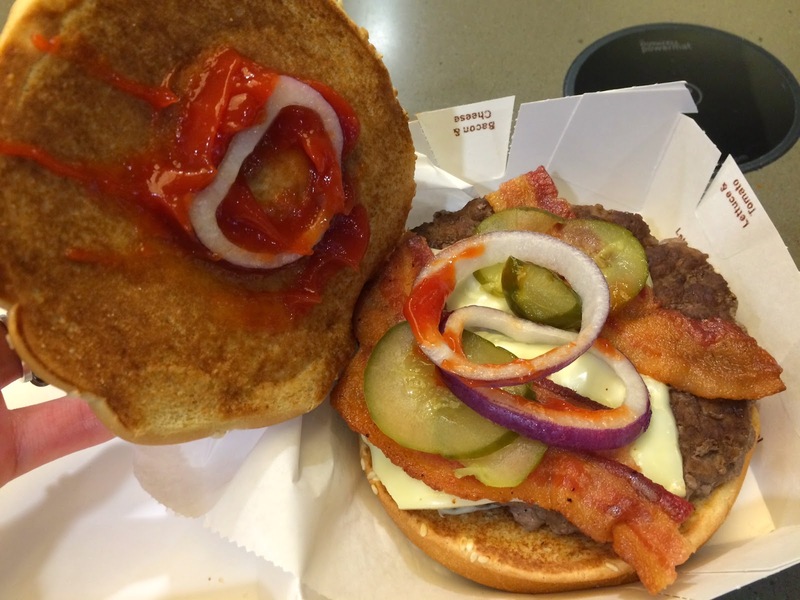 I could tell the bacon strips were crispy when I saw them staying straight when I picked up the burger. 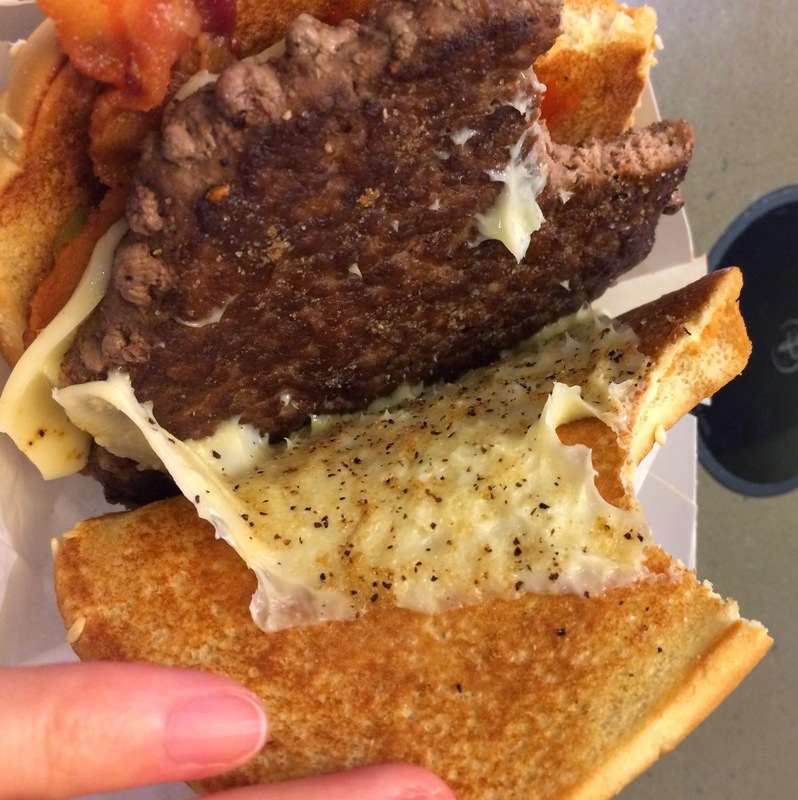 There's another white cheddar cheese underneath the patty, and the cheese captured lots of black pepper from the patty. 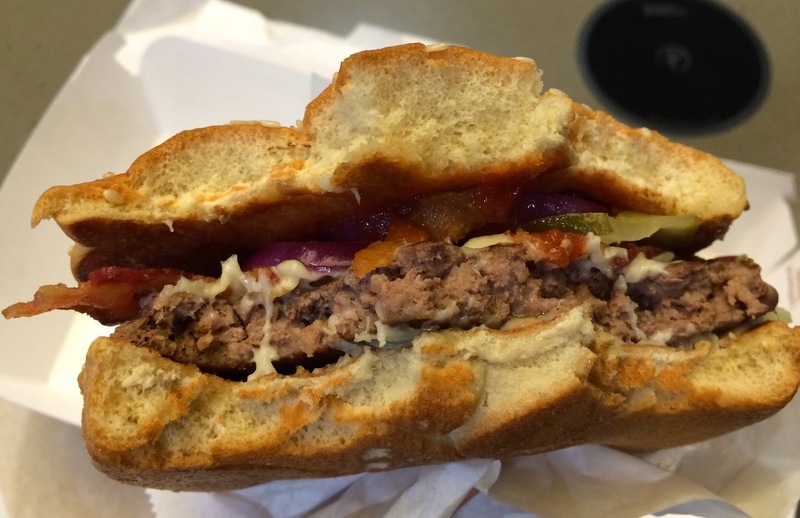 As I thought, the bacon strips were so crispy, and even crunchy, red onions were crunchy and added fresh flavor, pickles were sour and crispy, and the patty was as juicy and tasty as Steakhouse. I was afraid that bacon may be too stinky to eat, but they're so flavorful without odor. 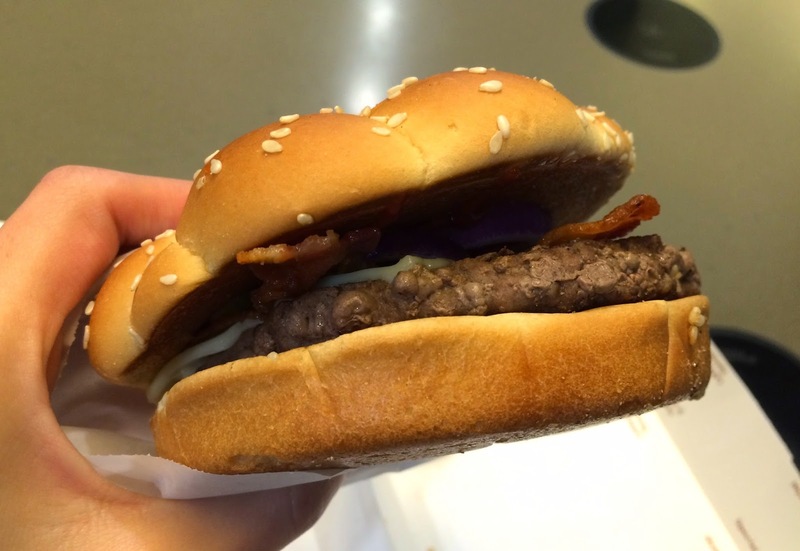 It's basically a bacon cheeseburger, but with the fluffy and large buns, 100% sirloin juicy patty and fresh onions, the flavor and taste were much better and tasted upscale cheeseburger to compare with regular cheeseburger. I feel like the white cheddar cheese made a huge difference in the flavor and taste as it's much plainer and less salty to compare with their yellow cheese.